Usage: Indoor and Outdoor Coffee Chair /Dining. We are offering high quality Stylish Plastic Chairs to our most reliable customers which are situated all round the nation. These Classic Cafeteria Chairs are a perfect blend of style and comfort. Moreover, the material used in manufacturing these Classic Cafeteria Chairs are of superior quality which is durable in nature. 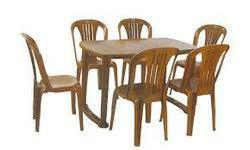 - The leading manufacturer and supplier of superior quality designer moulded plastic furniture. - Supreme Furniture is considered the pioneer of lacquered and upholstered moulded plastic furniture in India.